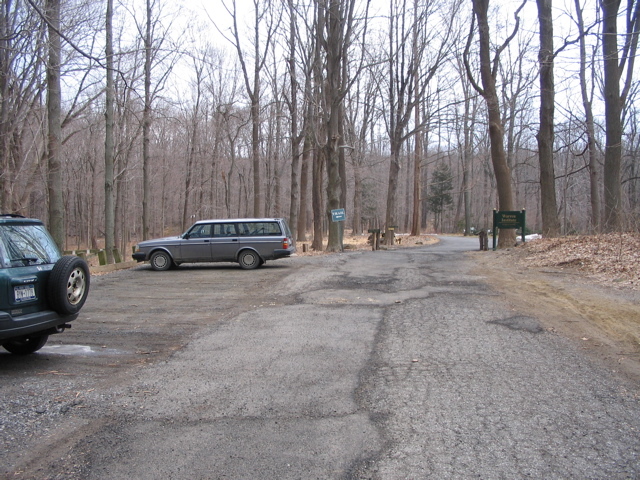 Kitchawan Preserve is located on the Croton Reservoir, off of Route 134 between Route 100 and the Taconic Parkway. 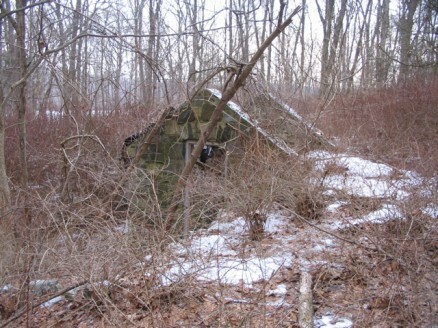 It used to be part of the Kitchawan Research Station of the Brooklyn Botanical Gardens, but in 1989 was acquired as Westchester County parkland, and has since become very popular with canine-owning local residents. As with all Westchester parks that allow dogs, they are required to be on a leash no longer than 6 feet. However, of the half-dozen dogs I encountered only one was leashed, and that was because the owner put one on when she saw me. A nice gesture, for sure. I happen to love dogs, so am not concerned for myself. Other people are not so comfortable with dogs and should be considered. 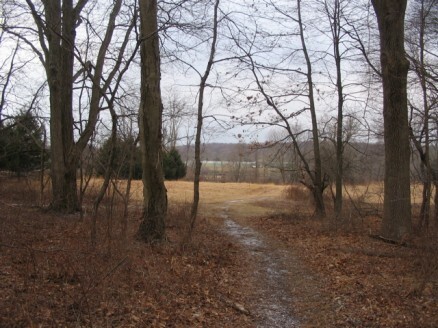 Though I do understand how good it is for dogs to have freedom of movement and be allowed to run, consideration for the actual residents of the preserve (deer, rabbits, chipmunks, fox, etc) should be a priority. Most dogs are easily controlled and have been properly trained, but I did experience two dogs that came crashing through the brush, their owners nowhere to be seen. They were just running wild, completely unsupervised. Not good. 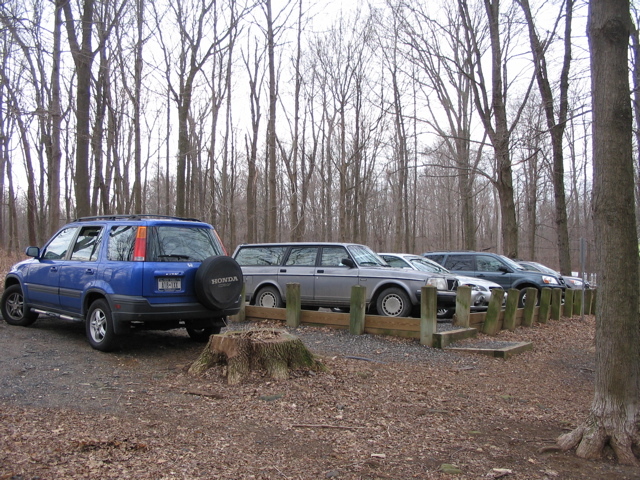 The entrance to the preserve is easily accessible from Route 134, and there is a large parking area. 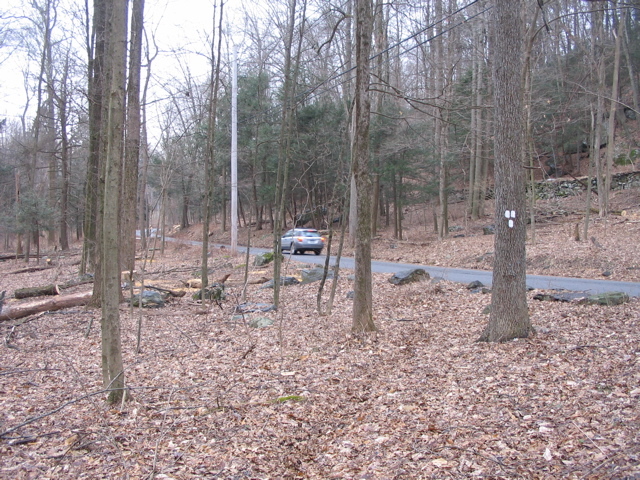 Exiting the preserve is another story since Route 134 curves very tightly there. A convex mirror is positioned to the left so you can get a glimpse of what’s coming around the curve, but extreme caution is necessary. After entering the driveway you’ll notice a couple of buildings and a sign announcing the Warren Institute. I originally thought that it was some organization associated with the preserve that was likely doing ecological work, but after a quick Google search it turns out that they’re a medical research group based in Tarrytown who bought the building from the Kitchawan Institute in 2001 (from nytimes.com). Most of the trails at Kitchawan are in the eastern half, where the parking area is. 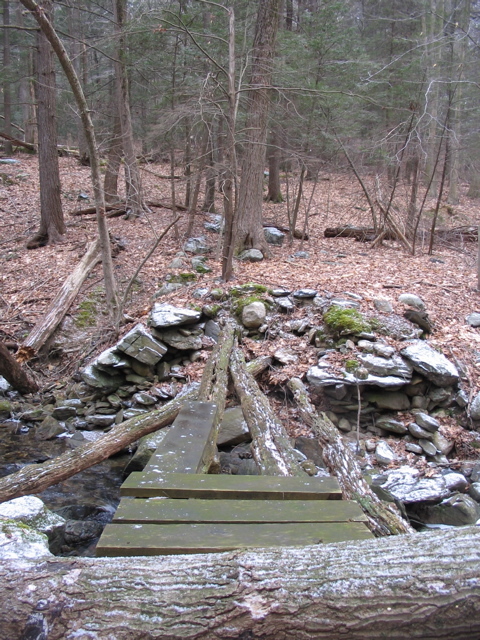 The western half is accessed by crossing a short bridge over Little Brook. I started with the trails in the eastern section, going counter-clockwise, with a plan to cross the bridge and head to the western section. 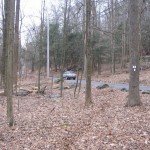 The main trail from the parking area is very wide, and all trails that shoot off from it are well marked. 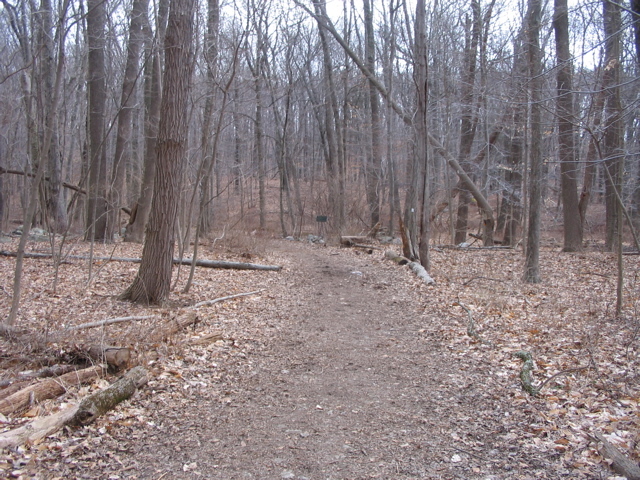 The Ledge Trail is the first trail to split off to the right. It curves around to the north and gives some nice views of the Croton Reservoir. It is, however, close to the intersection of Routes 134 and 100 so there’s quite a bit of traffic noise. I was out early in the morning, so it may have been especially bad because of rush hour, and that 134 is a direct route to the Taconic. I then connected with what I assume is the main trail (no name) and took a right, which led me down a steep hill towards where power lines cross the preserve. The trail follows the power lines for a little while then cuts right where it crosses the North County Trailway, a 22 mile paved trail that was once a railway serving Westchester county. My wife and I have biked parts of it. 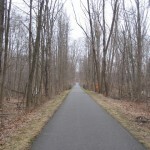 It connects with the South County Trailway to the south, and the Putnam Trailway to the north. The Quarry Ridge Trail loops around a little ridge that brings you in close proximity to the reservoir, which you’re reminded frequently with posted signs that you’re not allowed to get near. 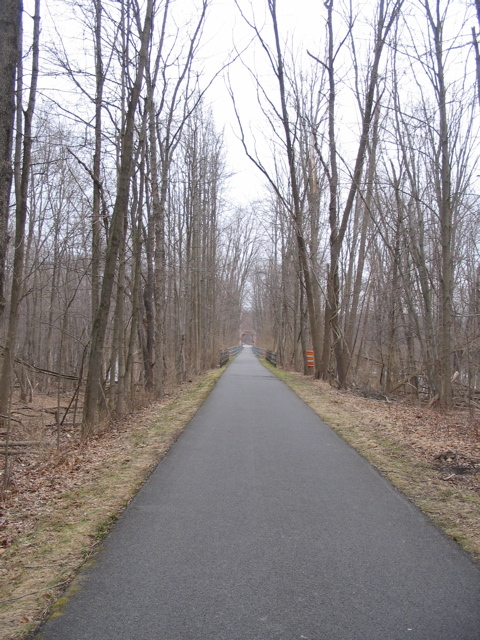 It’s a nice easy and short loop that brings you back across the North Count Trailway and the power lines. Walking back up the main trail you see blazes for a horse trail-riding association, which I couldn’t find any information about online. There are quite a few of these associations in the area as there are quite a few horse farms. 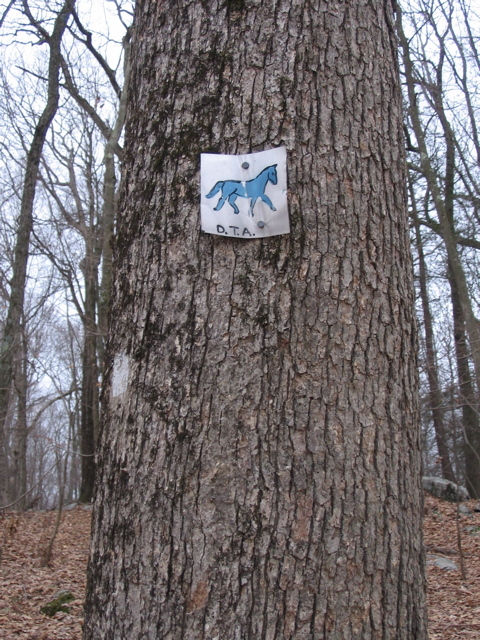 The Bedford Riding Lanes Association seems to be the most active and has relationships and agreements with land owners to allow their trail system access to private land, as well as in preserves and parks. To get maps to their trails you have to join, which I’m hoping to do soon. I pick up the Red Oak Trail (blazed red) to the right and follow it as it loops around to meet up with the Little Brook Nature Trail. 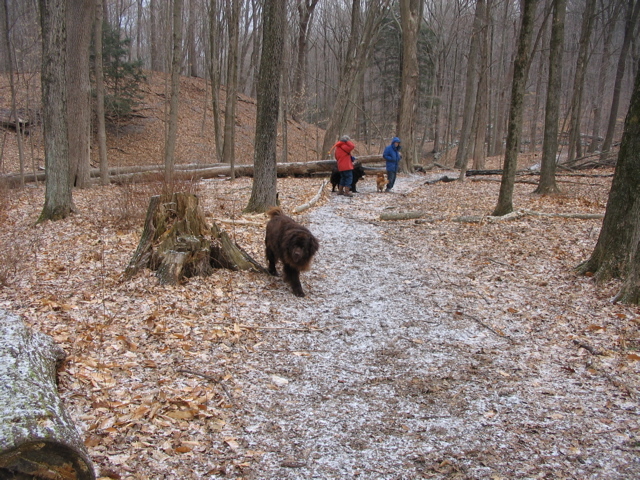 As I start on the Red Oak Trail it begins snowing big fluffy flakes, and I’m amazed how quickly the weather can change. Then as soon as it began, it stops, though it continues to hail a bit. 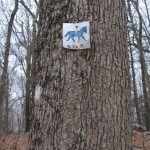 As I connect with the Little Brook Nature Trail I hear barking and encounter the first people out with their dog. 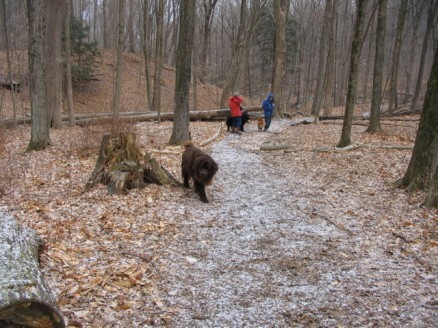 Then two massive Newfoundland’s bound down a connecting trail. It’s a party! 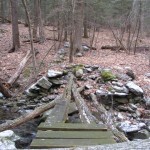 After visiting with the dogs and talking with their owners I cross the bridge over Little Brook. The trail goes up a switchback and leads you to an open field, gold with the dead grasses of last year. Across the field I see Centerline Stables, a horse farm where, up until fall 2007, my friend Matt was the facilities manager and his wife Lisa was head trainer. Following blazes, I take a right on what looks to be an old farm road. It’s an even and straight path. I pass the remnants of a gate and shortly get a glimpse of an old wood structure that’s fallen in on itself. It appears to be the remains of an old barn. Across the trail is another stone foundation. Was this the house, or another barn? I love this stuff. I gets my imagination going, wondering who the people were that lived and worked here and what their lives were like. 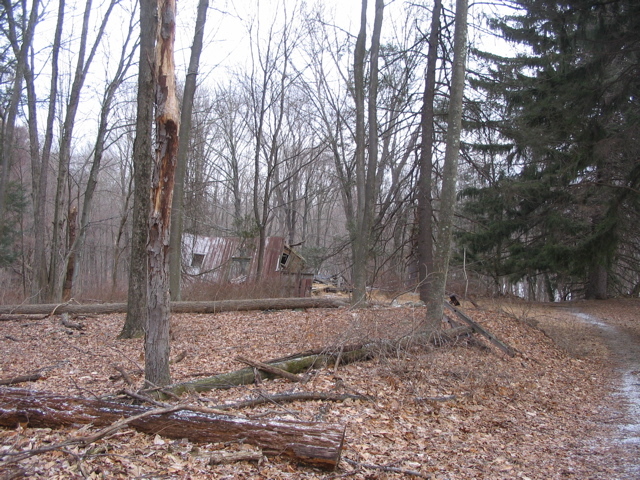 As I circle around to the left on the trail I see another foundation, though partially removed. A root cellar, maybe? There is a farm next to the preserve, Kitchawan Farm, that has been in the same family for just about 100 years and grows vegetables, herbs and flowers, and sells them at their own farm stand and at Muscoot Farm in the summer. They’ll likely know the history here. As I continue down the path I spy two pointed stone walls very close to each other. 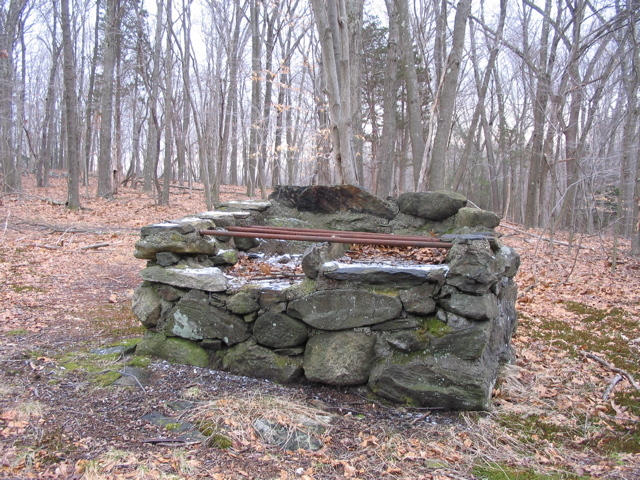 It turns out to be a little stone structure with a door. 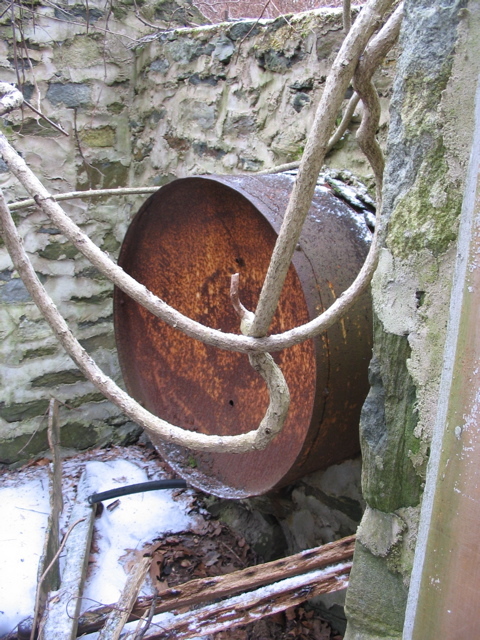 As I investigate I find that there’s a metal barrel sticking out of one of the inside walls. Strange. What is it for? I need to know more about what this place was. 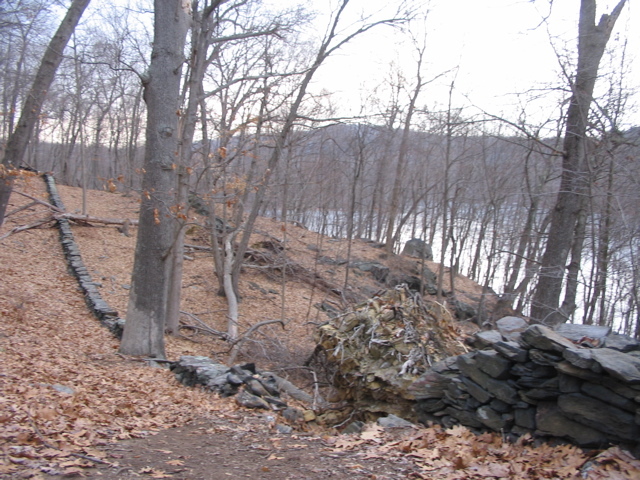 I continue along the trail, with the reservoir on my right, following old stone walls from this old abandoned farm. After climbing a hill and entering a grove of eastern hemlock I get a great whiff of sweet hay and horse manure from Centerline Stables. It smells great, and reminds me of the times I visited my friends when they were working there. 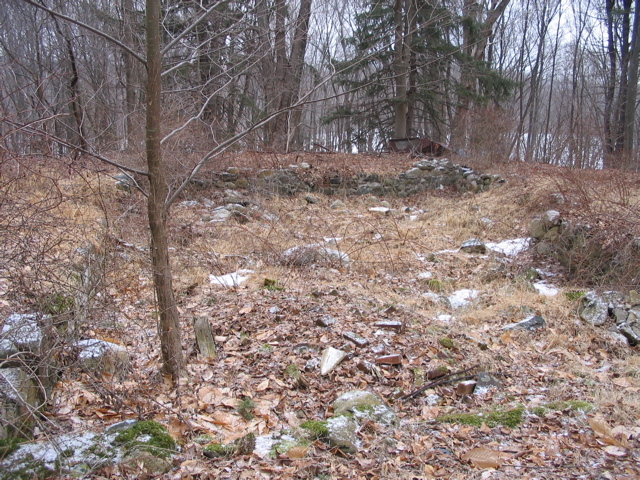 After the hemlock grove I spy an old, small stone structure, and walk around it. It’s an old barbecue. There’s not really anything else around, and I’m wondering why it’s here, and what they cooked on it. The trail opens up into another pasture and the light is golden as it reflects off the grass. There are birdhouses on poles here and there, and though there are little signs on them, I don’t want to get too close and disturb the occupants, so I don’t know who put them there. The trail meets another trail coming in from the left that I later learn connects with the trail back to the parking area, but cuts through the fields, which I think is private land, though it doesn’t appear to be posted. I take a right, and walk through more open pasture. There are several trails cutting across the fields and it’s not so obvious which one I’m supposed to follow, but then I see a white blaze to the right, and follow. 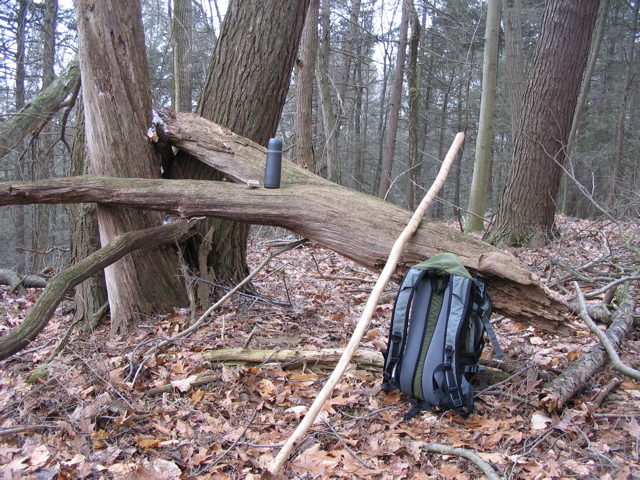 Back into the woods, I’m presented with a sign, Hemlock Ravine, that points in both directions. Checking my map I see that the path to the right dead-ends, so I fork left. There’s an abundance of hemlock on either side of the path as I follow it down towards the ravine. It’s gorgeous here: very wet and lush. The stream, Big Brook, is flowing strong. There’s a bridge across to the other side, but it doesn’t look very sturdy. 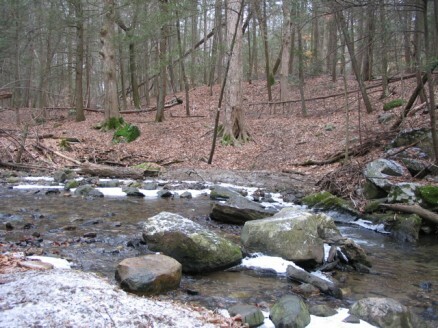 I scope around and see that the trail actually crosses the stream easily over some rocks. 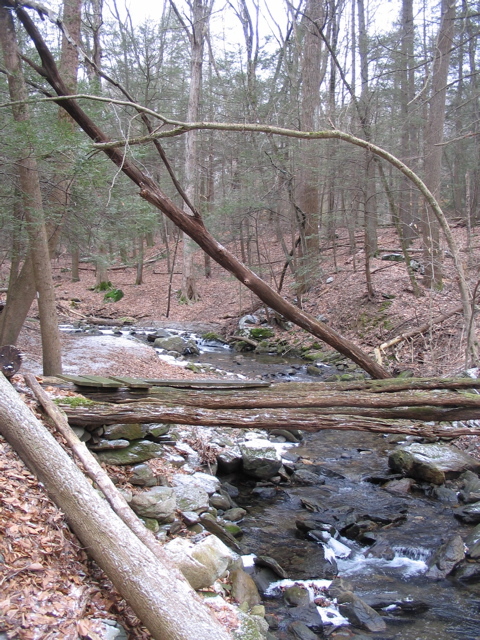 After crossing the stream the trail winds up and around Chestnut Hill. The trail is not very clear, and this is just the way I like it: a bit more wild and trickier to navigate. There are lots of ferns, flattened to the ground from the winter snow, and I think of how different this place is going to look in the summer. I find a nice spot to stop, as I’ve been walking pretty hard for about two hours, and break out my thermos and granola bar. It’s lovely to just stop and listen, without the crunch of dry leaves. I feel a vibration in my chest pocket. My cell phone is ringing. Damn! It’s work-related. I’m pulled back to reality and realize I’ve been out in the woods too long. 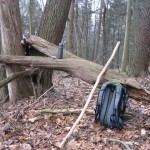 I shoulder my pack and hit the trail. As I’m circling back towards the ravine I hear the unmistakable sound of a cars tires on wet asphalt. Then I see that I’m only about forty feet from Arcady Rd. A side-path cuts to the right and I follow it to see if there’s maybe a parking area over here. A Subaru passes by. I’m amazed that I didn’t notice how close to the road I was. Coming back to the main trail I see this unusual growth on what appears to be a healthy, young tree. 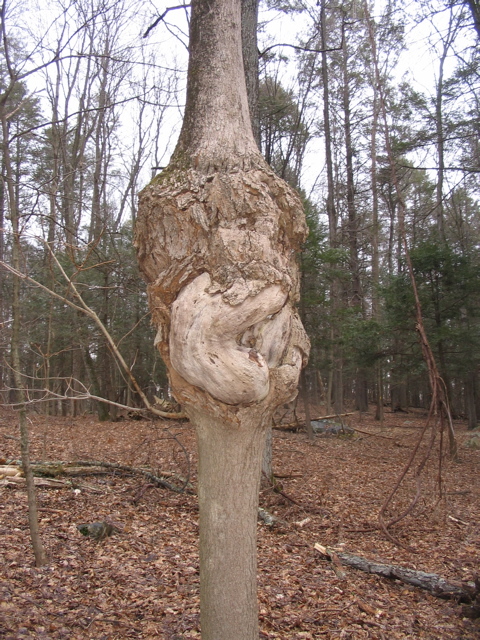 It’s amazingly contorted and deformed, yet the tree grows straight. I’m pouring on the steam trying to hurry back to the parking area. As I cross the bridge over Little Brook I see several more people with their dogs. It’s a popular place, which is more obvious when I get back to the parking area. This is a great place to hike, especially if you like dogs, or have a dog. 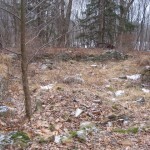 The western part of the preserve, to me, is much more interesting, with the farm ruins, and more rugged and wild terrain. 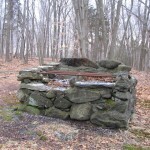 This entry was posted in Hikes and Walks, Kitchawan Preserve on February 26, 2009 by Alex Smoller.